This thoughtfully designed and beautifully constructed home at Glencoe in The Trossachs is the epitome of contemporary Eastside living, with four bedrooms, four baths and over 3,361 square feet of graciously scaled space. Situated in a private cul de sac, the home was recently constructed in the Arts and Craft style to blend elegantly with its lush native surroundings and features a classic recessed stone entry with decorative columns that complement its flared shingle siding. 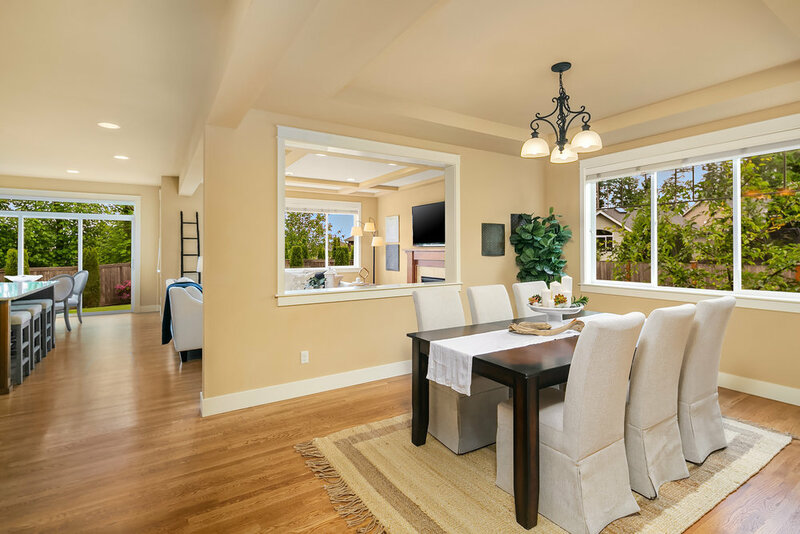 Large windows frame verdant garden views and flood the home with natural light, creating a residence that is always sunny and warmly inviting. The residence consists of two full floors, with an oversized two-car garage, and a spacious, level yard with meticulously maintained landscaping. The leaded glass front door opens into a foyer that leads to a home office and back into the main living area of the house. These interlinked spaces include a large, open dining area, a living room that attaches to the gourmet kitchen, a first-floor bath and a large den/multi-purpose room off of the kitchen. Sliding doors lead out to the backyard patio and play area, while a large mudroom and storage area provides direct garage access. Natural light fills this thoughtfully designed home from the FOYER onward, augmented by nine-foot ceilings and oversized windows that frame lovely views of the surrounding neighborhood and nature. 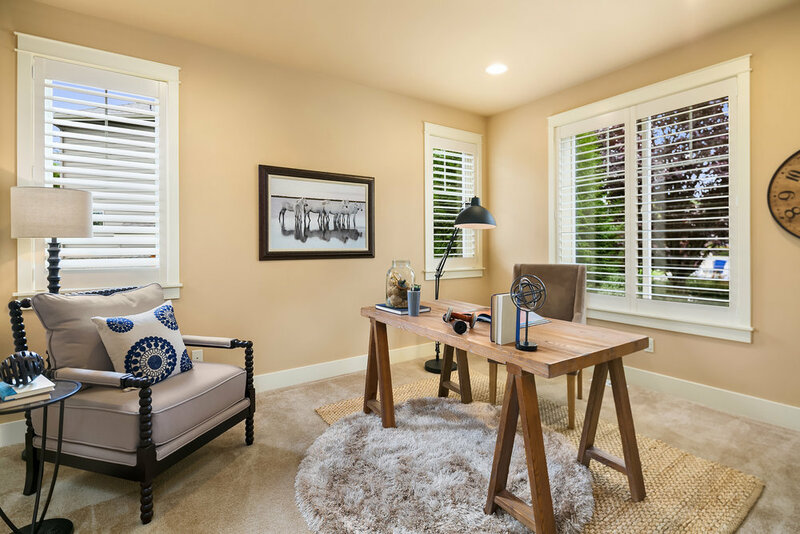 The OFFICE to the right of the entry is an airy enclave from which to conduct business, with plenty of space for seating and desk areas, as well as three large windows that overlook the yard, with elegant plantation shutters for privacy. Moving just past the office, there is a coat closet and an elegant three-quarter bath and POWDER ROOM that is appointed in large format porcelain tile. A large display alcove is recessed into the entry wall across from the office, creating a point of interest in the foyer. The open dining area is a gracious center of the home, defined on three sides by the staircase, a window wall and a wall with a large pass-through that overlooks the main living area. It can easily accommodate a table for eight, with room to expand for larger scale entertaining. 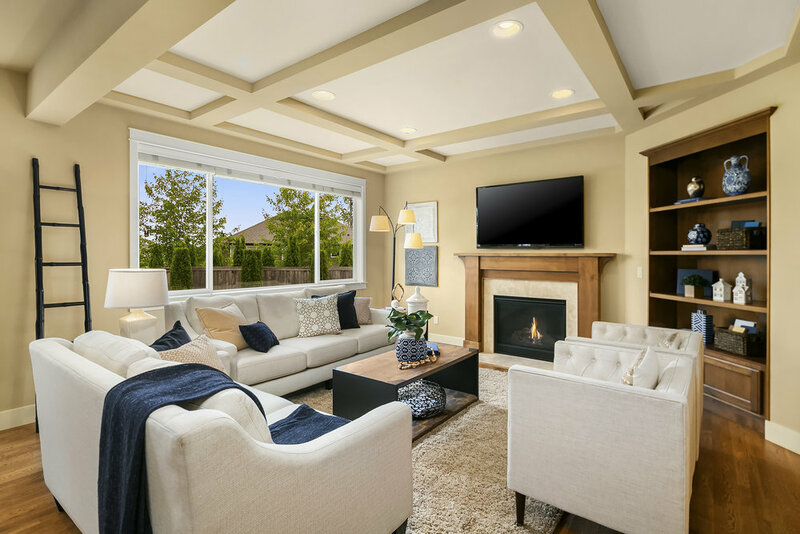 The LIVING ROOM is a sumptuous retreat toward the back of the house that is anchored by a gas fireplace, set into a rustically elegant wood and stone mantel. Box beams define the ceiling and there are built-in display shelves in the corner of the room. The area above the mantel is wired for a flat panel television, and a large window overlooks the backyard. 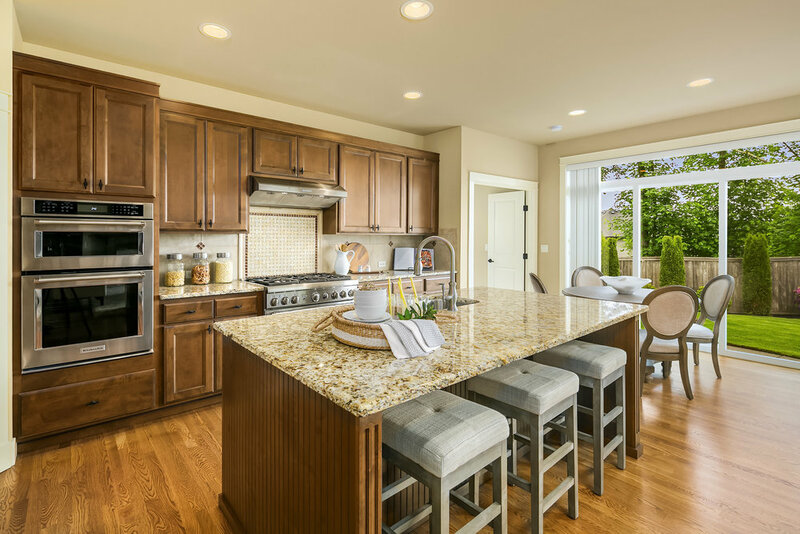 The KITCHEN is a gourmet’s delight, with walnut finished cabinets, slab granite countertops, a walk-in pantry and a spacious island that is ideal for cooking, gatherings or casual meals. The top-of-the-line suite of appliances includes a Samsung refrigerator, Kitchenaid wall oven and microwave, a six-burner Thermador dual fuel range and Kitchenaid vent hood and dishwasher. The island contains a deep, double bowl stainless steel sink and all backsplashes are custom tile, with an intricate woven pattern set behind the range. The kitchen is directly open to the main living room, creating a casual hub for relaxation and easy communication during meal preparation. It also includes a BREAKFAST AREA for casual dining and homework toward the back of the house. A pair of doors opens from the kitchen into the BONUS ROOM behind the garage, which is set up with carpeted floors and a wall of built-ins for storage and display. 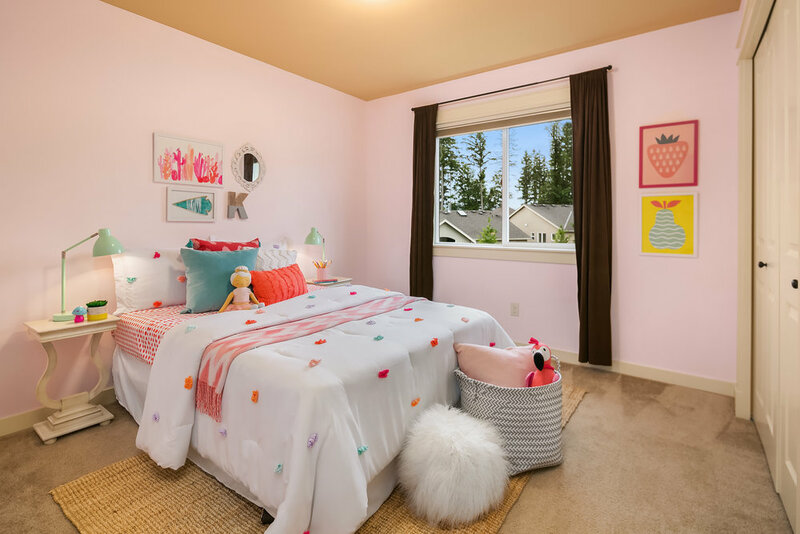 This is a wonderful multi-purpose space that is ideal for use as a playroom, craft area or media room, and which can be easily closed off from the rest of the house for privacy. The interior continues the house’s Craftsman style, with naturally finished oak hardwood floors throughout the main level and detailed window casings and door moldings that add a touch of period charm. 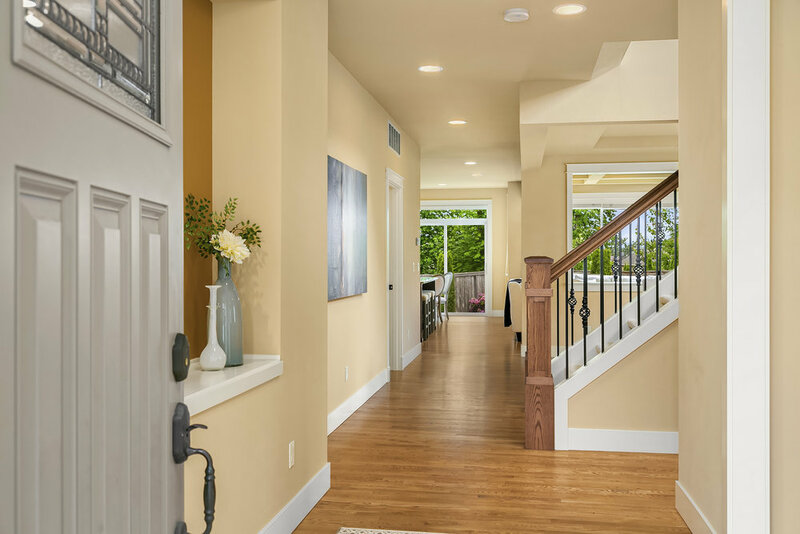 Recessed lighting provides great ambient illumination, while the wrought iron staircase railing and lighting fixtures blend beautifully with the home’s warmly neutral palette to create an atmosphere of inviting comfort and everyday luxury. Upstairs, four bedrooms and a large family room are arranged around the landing. At the top of the staircase sits a sumptuous and PRIVATE GUEST SUITE that includes an ensuite bath and walk-in closet – perfect for returning and long-term visitors. 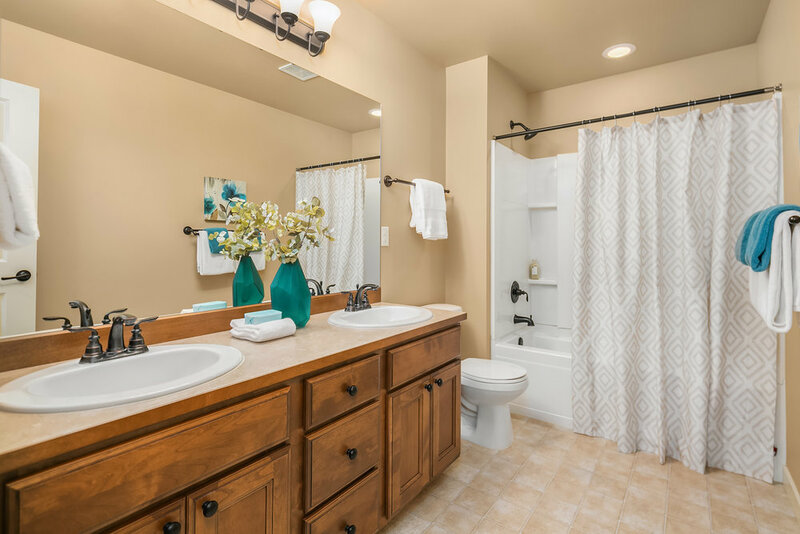 A second-floor LAUNDRY ROOM with top-of-the-line, front-loading appliances, as well as a utility sink and storage area, is just behind this room, while two ADDITIONAL BEDROOMS share a spacious full bath with a two-sink vanity. The upstairs landing is anchored by a graciously scaled UPPER FAMILY ROOM that is accessed and easily isolated by a pair of doors. This room is a great multi-purpose area that can function as an upstairs play area, a media room, library or study, and it provides an inviting gathering space for the second level. 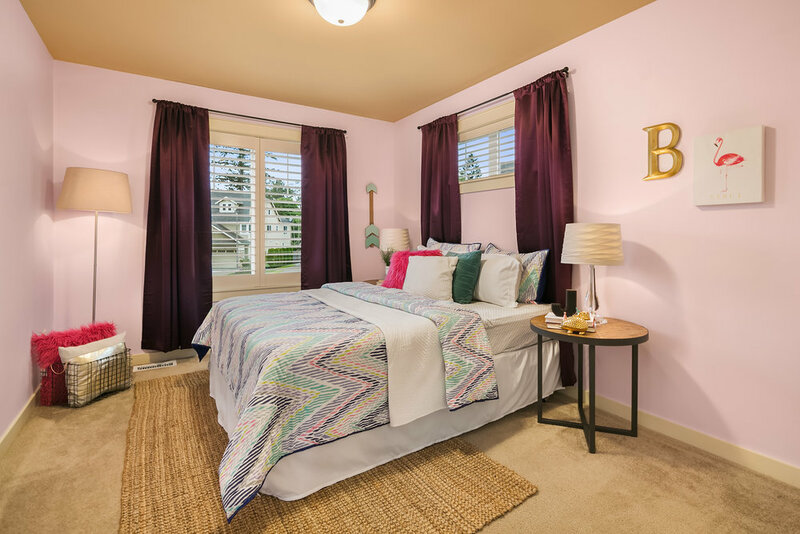 Finally, a huge MASTER SUITE occupies the back of the home, accessed by a pair of doors, and featuring an oversized sleeping area with plenty of room for seating, a walk-in closet and an opulent master bath. Vaulted ceilings further enhance the airy sense of volume that this suite affords, along with a deeply recessed alcove for a dresser or media. This peaceful and private enclave overlooks the backyard and provides a luxurious retreat from the stresses of the day. The spa-like bath includes individual vanities, separated by a deep soaking tub, as well as a built-in lounging couch under a clerestory window. The water closet is in a discreet room of its own, and the walk-in shower can easily accommodate two people. The room is finished in elegant porcelain tile with custom backsplashes and natural wood cabinetry and casework. The property is surrounded by a level yard with mature native landscaping and formal plantings that lead to the front door. A well-tended lawn with a backyard PATIO is perfect for outdoor relaxation and play, while fencing and plantings provide screening for privacy. The THREE CAR GARAGE provides one bay that is extra deep for storage or shop space. This is a meticulously maintained and move-in ready house in one of the Eastside’s most sought-after neighborhoods. With beautiful tree-lined streets and tasteful, historically influenced architecture, Glencoe is an inviting and friendly environment for those seeking a home with room to grow and access to award-winning schools, the Eastside tech corridor and all the outdoor activities that make the Northwest such a great place to live.